Happy Friday everyone! Somehow, with last weekend as a holiday weekend, and with Monday off, I forgot that today was Thursday... and that you all would want to post your recipes! Hope you all had a fantastic weekend. I spent a lovely long weekend with my hubby. We will spend most of the summer apart, trading time off at home between our various trips, so it was absolutely wonderful to spend some quality time together. That brings me to another fabulous point... because I'll be spending a month traveling in China with my mother, I've asked my friend Heather from Girlichef to help host Friday Potluck while I'm gone. Granted, it's still a month away, but I want to start preparing you for a month away! More details later. Thanks for swinging by this week. I look forward to your lovely posts! As always, there are just a few rules, but they're super duper simple! 3. 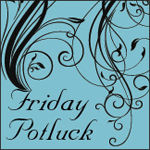 Be sure, in the linked blog post, to link back here to Friday Potluck @ EKat's Kitchen using the button above or text. 18. Strawberries season, make a roll! 58. Fruit Snack w Chocolate & Exciting News! On Louisville, on China... and July!